Top from the left: Maya Eva Haugen, Alicia Smith, Rafael Moraga, Mia Dougherty, and Emily Huggett. It’s never too late to take up something new. 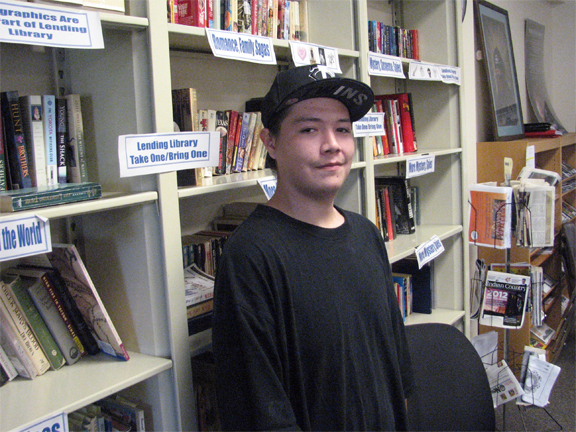 A door opened and Alicia Smith (Yup’ik) and her mom, Grace Smith, became actors. Pretty much just like that. “The New Native Theatre provided us with an opportunity in a safe, welcoming place with other Native actors who share similar worldviews,” Smith said. 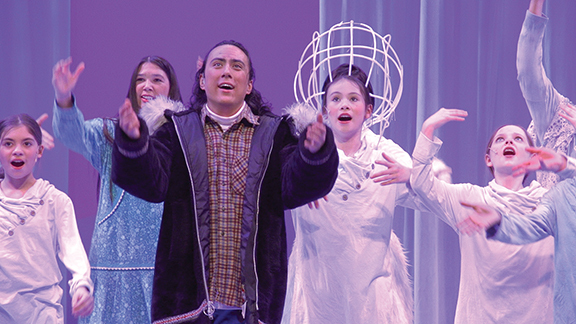 The New Native Theatre and Stages Theatre Company collaborated to produce “The Three Snow Bears,” a one-hour children’s play loosely based on the book by Jan Brett. 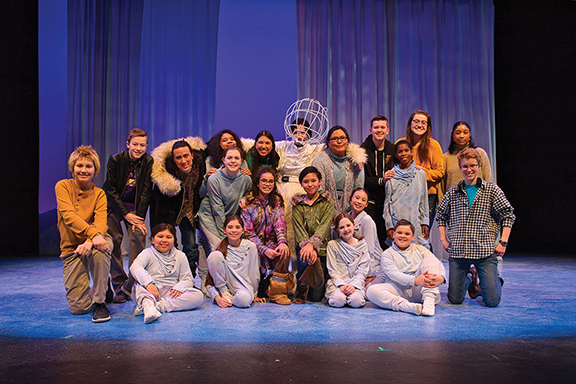 The production runs through Feb. 18 and tells a story set in the Arctic of a young Yup’ik girl who goes on a sled-dog journey to save her village from the impact of climate change. While seeking reasons for environmental change, the girl meets a raven, hare, baby seal and three snow bears. The baby bear and children work together to find solutions in this world premiere production. Middle: The full cast pose for a group photo. Collaboration occurs on stage as children and animals address problems. And it occurred at the earliest phase of production development when Stages Theatre Company and New Native Theatre (whose artistic director is Rhiana Yazzie) agreed to co-produce the play. Actor Alicia Smith was cast as a mom and a Mama Bear; Grace Smith plays Spirit Voice. Other actors, mostly children, include Mia Dougherty, Maya Eva Haugen, Noah Hendrickson, Jei Herald-Zamora, Emily Huggett, Sara Magnuson, Marcelo Mena, Rafael Moraga, Gideon Pressley, Arianna Sanford, Gia Strom, Alex Weiner, and Celia Adeline Wendt. The script was written by Rhiana Yazzie with input from the Smiths. 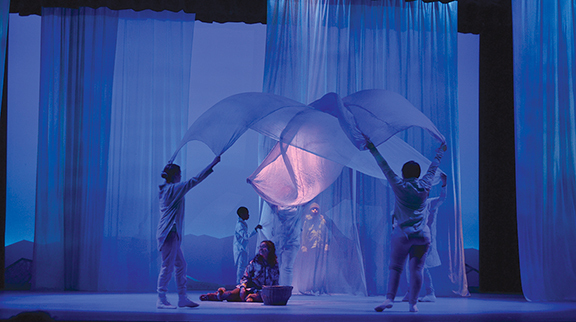 The contemporary play draws on Yup’tik language, music and culture with an emphasis on the importance of family, the power of dreams, animal migration and the environment. 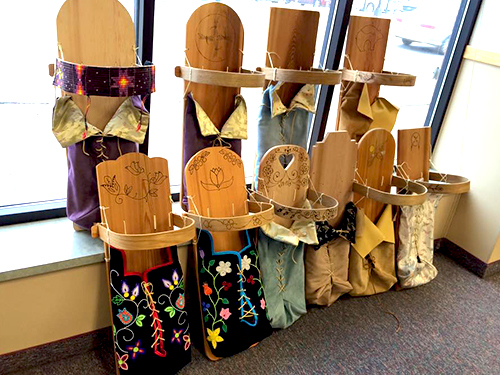 The Yup’ik believe that every human being is born with a gift, and that each gift is different from the next person’s gift. Respect for land and nature are key messages in this play, as well as the importance of sharing, respect, spirituality, cooperation, and humor. Children lead the adults on their theatrical journey. Smith said, “Working with them was spectacular and made me feel younger.” Although the topic of climate change can be complex, the children in the cast understood what it meant, and its dramatic effects. As an introvert, acting challenges Smith to step from her comfort zone to be creative and a better person, she said. “The Three Snow Bears” represents a partnership between two established theater companies, Stages and the New Native Theater. “The production will open more eyes and ears to each playhouse,” Smith said. Additionally, the play is a sweet tie to Smith’s Alaskan homeland and culture. Acting and singing gives a connection to her tribe and eases some homesickness. Her theatrical experience started with the recording of a public service announcement for American Indian Month. One thing led to another and now mom and daughter have appeared in three productions since 2018. Sandy Boren-Barrett and Sara Pillatzki-Warzeha (Dakota/German) co-directed the production and Alaskan musician P. Ossie Kairaiuak (Yup’ik) composed its music. Boren-Barrett said that the job of a director is the same whether the cast is made largely of children or adults. “For me, kids are intuitive and smart,” she said. Children come to the table without the preconceptions of adults and understand the storytelling role they play as actors, Boren-Barrett added. Children will see actors who look like them on the stage, and they’ll feel welcomed. The Stages Theatre Company is located at 1111 Mainstreet in Hopkins. For tickets call the box office at 952-979-1111. The play runs through February 18th.